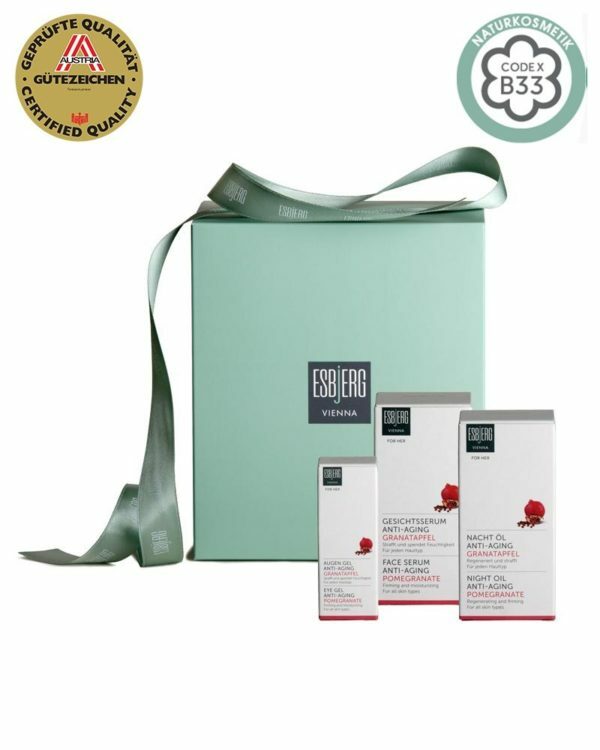 Pomegranate face care gift set contains an Esbjerg gift box, Pomegranate Face serum, Pomegranate Night-Oil and Pomegranate Eye Gel. Promotes toned and moisturised skin (suitable for every skin type). The unsaturated fatty acids of the easily absorbed Face Serum Pomegranate ensure an immediate smoothing and leave the skin with a soft feeling. It strengthens and moisturizes the skin and prevents it from free radicals, which may cause harm to the skin. It reduces the appearance of noticeable wrinkles and promotes a toned and smoothed surface. The night-oil is rich in the most effective qualities of pomegranate seed´s extract. Suitable for every skin type (from sensitive to dry skin), the Anti Aging Night Oil regenerates and tightenes up the skin. The nurturing texture of organic pomegranate seed extract and vitamin E provides the skin with valuable energizing elements. 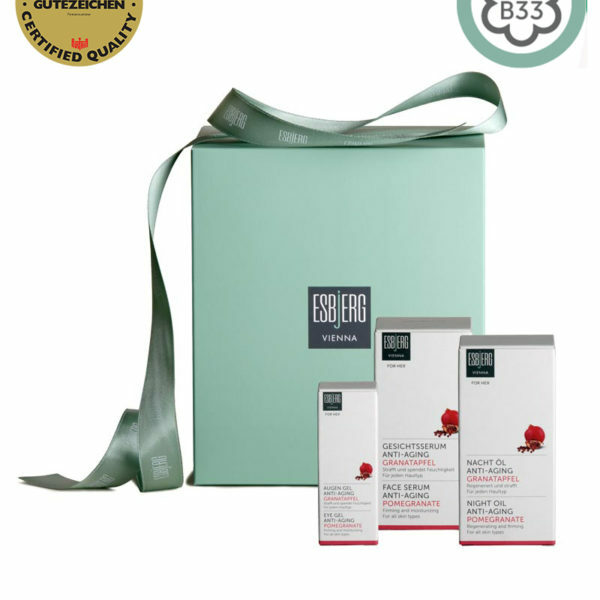 First-class biological ingredients alleviate signs of fatigue and facilitate the regeneration of the skin. The 100% natural Night Oil essence is quickly absorbed and treats your body to youthfully fresh and tight skin in the morning.